If you haven’t noticed, I’m a big fan of the shirtdress. Just to give you a few examples, you’ve seen me feature them recently here, here and here! I find them to be extremely versatile, sophisticated and flattering. The shirtdress is a classic wardrobe staple that can be pulled out for nearly any occasion: wear it to the office, on the plane, to brunch or even to date night dinner with the right accessories. 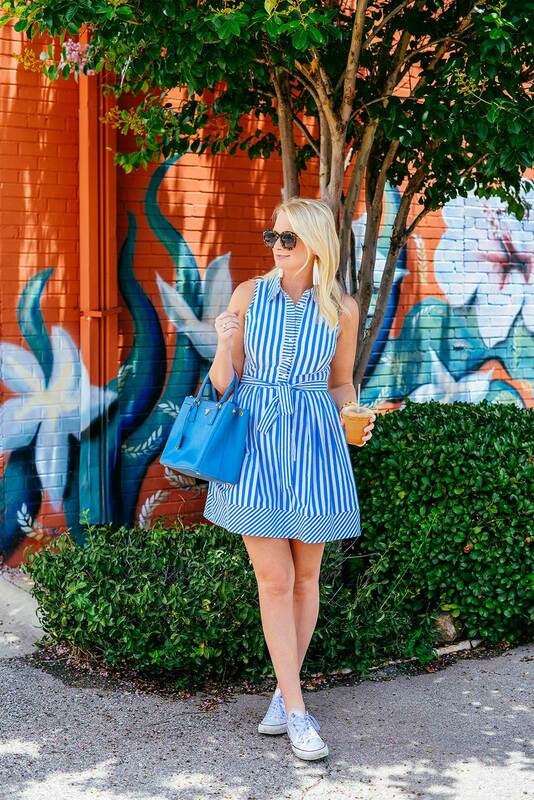 This blue + white striped Milly dress is such a perfect piece for summer, don’t you think? This midi-length shirtdress is the ideal cut for work. This collared white shirtdress is ready for some country clubbing. 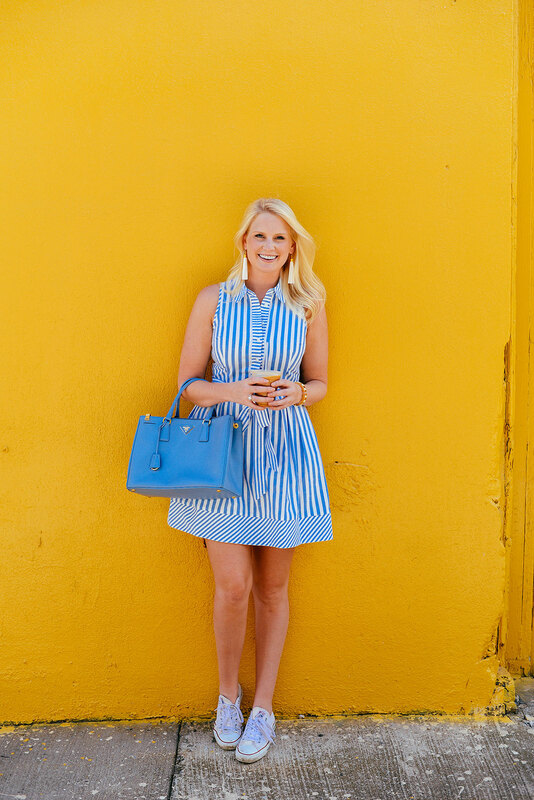 My yellow Tory Burch shirtdress is now 40% off! The faux sleeves tied at the waist give this shirtdress a trendy take. Adore the corseted bodice of this Jason Wu dress! Oh this is such a beautiful look! Love how you combined the Converse <3 Looks great! This is just the cutest look, I looooove this milly dress and that blue Prada is a beauty. This shirtdress is the cutest! I love how you paired it with the converse sneakers! 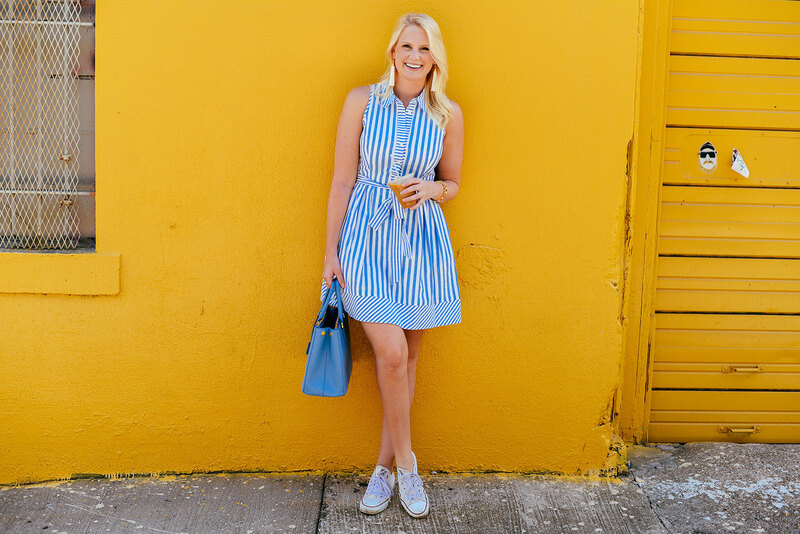 Loving the blue stripes on you – and those Chucks! Happy Wednesday, lady! 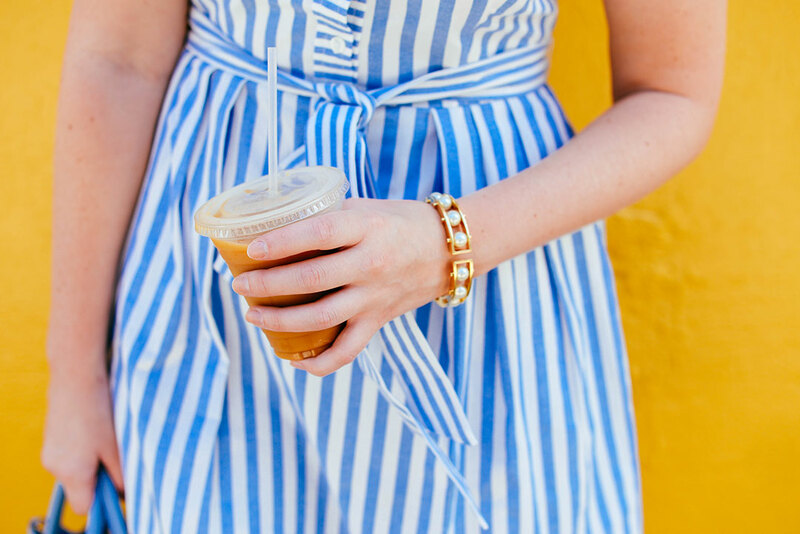 I love, love, love the variety of stripes in this dress — so chic, and perfectly casual with those sneakers; I would have really only thought to wear it with espadrilles or wedges so I love the inspiration to find ways to dress down some of my looks. Great idea! absolutely gorgeous! Love the stripes – and the bright backdrop. Love the different stripes on the dress! I just bought this the other day, isn’t it the best? Looks great on you! 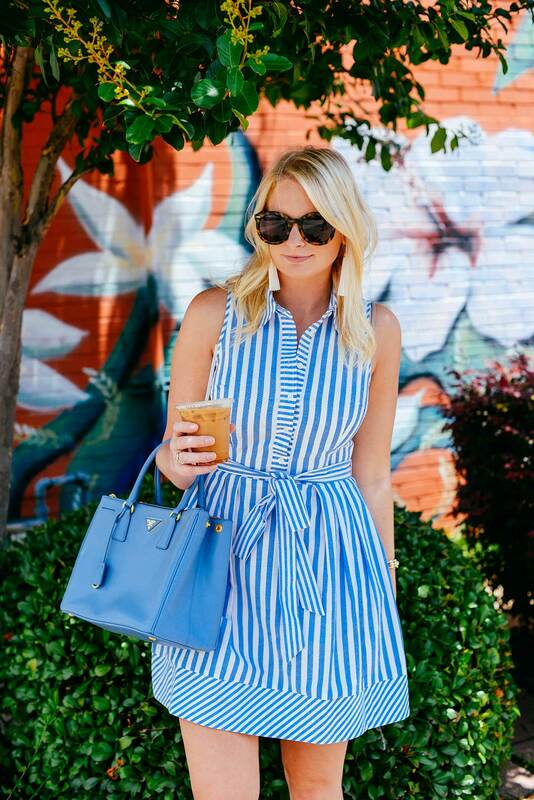 Love love love this dress and your styling of it, Merritt! I’ve been intending to pick up a new shirtdress this summer. Maybe this is the one. OOh this dress is so nice, love the cute design so perfect for summer. Love this beautiful yellow backdrop. And your look of course! 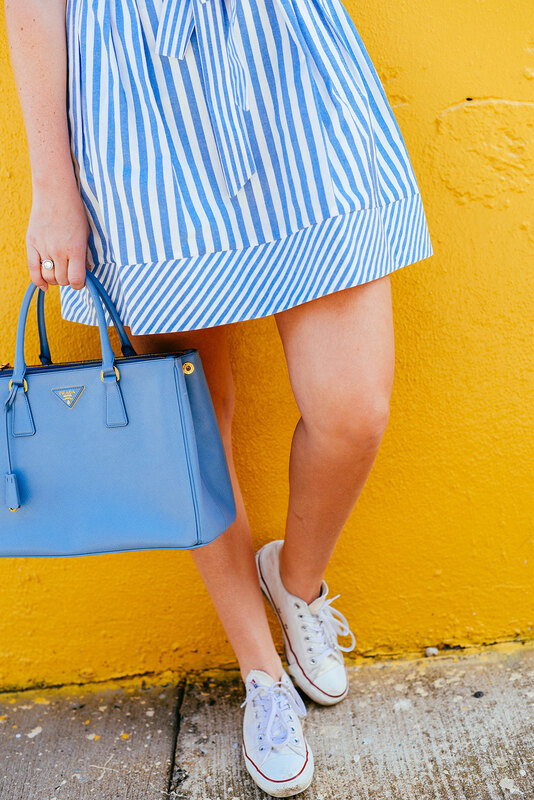 Stripes are perfect for summer! Merritt!!! This is one of my favorite looks of yours!! Man Milly is just killing it recently! This dress is about the cutest thing I have ever seen! Obsessed!